This looks gorgeous, I've never worked entrelac...is it difficult? I have some yarn from these guys on the way, how do you like it? 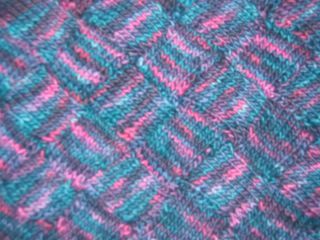 I had never done entrelac either. It was a lot easier than I expected. You get real comfortable with picking up stitches! I absolutely love the yarn. I find it really soft for 100% wool, especially after you knit it up. That looks great! Once I started making lady eleanor out of noro kureyon I wished I had used the manos because it is softer. Manos is one of my favorite yarns-- maybe I need to make another stole!! Gorgeous! I think entrelac really shows off the color variation in Manos. How many skeins do you think it will take? I'd go buy some now but I'm afraid it would turn into a $300 project. Based upon the yardage calculation in comparison with the original yarn, it would take about 9 skeins. I am using a size 10 needle. After blocking, I think this might yield more than the stated length in the pattern. But we will see!